• 02 World Dignity University video: Grandmothers for Peace in Oslo: Mai-Bente Bonnevie and Trine Eklund explain the activities of the Grandmothers of Peace in Oslo. 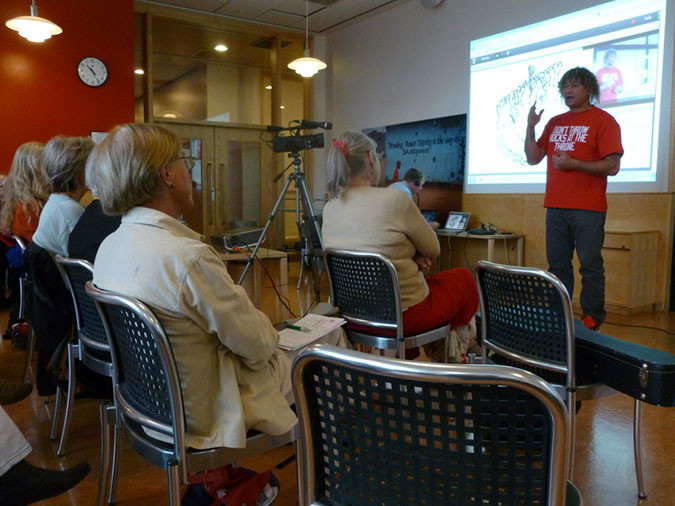 This video inspired the Grandmothers for Peace to create a more official film (see the English version and the Norwegian/English version) on 5th December 2012 in front of the Parliament in Oslo, Norway. Roger Haugen did the filming. The first part of this video is in Norwegian, the second part in English. You see Sissel Melbye explaining in English, Mai-Bente Bonnevie, Berit Waal, Trine Eklund, and many others. Lasse Moer and Evelin Lindner are currently downloading all the recordings from our video platform Adobe Connect. The recordings need to be edited before they can be placed on YouTube. 27th August 2012, Day One of the conference. Please click on the picture above or here to see all the 100 photos that Anna Strout kindly took on Day One. 28th August 2012, Day Two of the conference. Unfortunately, Dan Baron could not speak to us, due to an unexpected and sudden health problem. We wish you a speedy recovery, dear Dan! The plan was that he would conclude Day Two of our conference with a talk via video connection from Brazil about the arts-based pedagogical work he and his parter Mano Souza conduct in the Amazonian North of Brazil. We hope to learn more about your work at a later point in time, dear Dan! 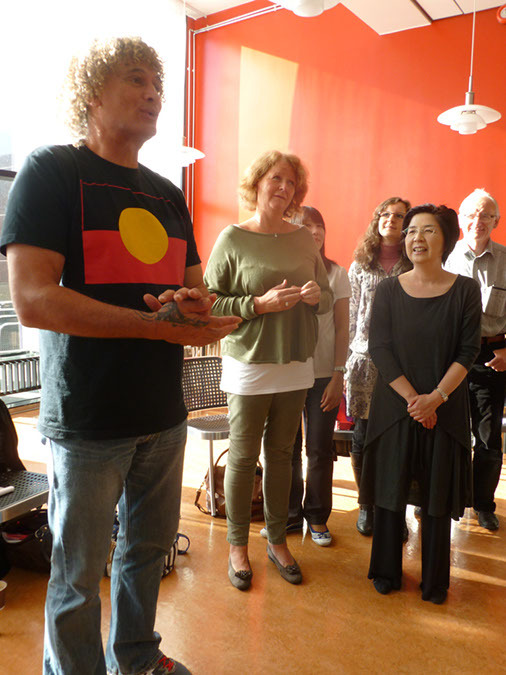 See the video titled Music, Movement, the Arts, and Mindfulness to Integrate Victims and Perpetrators of Violence that was created by Randi Gunhildstad from Norway, Tomoko Ishii from Japan, and Carmen Hetaraka from New Zealand. Anna Strout did the planning and video-taping. Please click on the pictures above or here to see all the ca. 50 photos that Anna Strout kindly took on Day Two. 29th August 2012, Day Three of the conference. Please click on the picture above or here to see all the 100 photos that Anna Strout kindly took on Day Three. 30th August 2012, on Day Four of the conference, Anne-Katrine Hagelund received the Beacon of Dignity Award from Inga Bostad, Vice-Rector of the University of Oslo, and Jorunn Økland, Director of the Centre for Gender Research at the University of Oslo. Please watch a video-tape of the award ceremony. 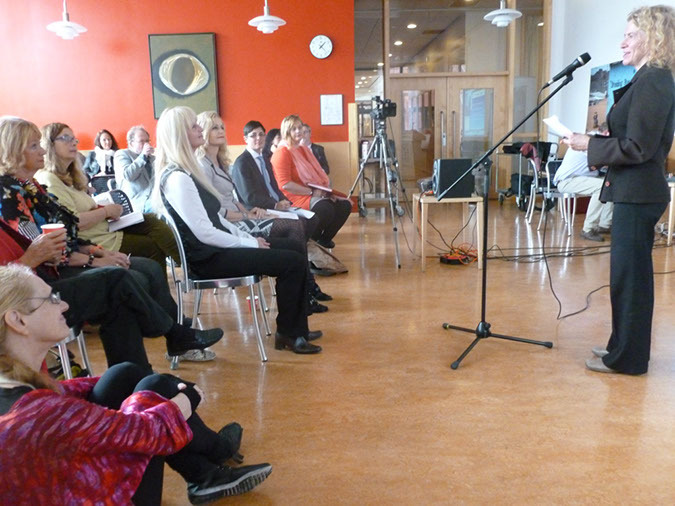 For a webgallery of the still pictures please click on the picture above or here to see all the photos that Anna Strout kindly took on Day Four of Anne-Katrine's award ceremony. You can also see the still pictures as pdf file. Please click here to see all the 122 photos that Anna Strout kindly took on Day Four. 30th August 2012, on Day Four of the conference. Please click on the picture above or here to see all the 122 photos that Anna Strout kindly took on Day Four. 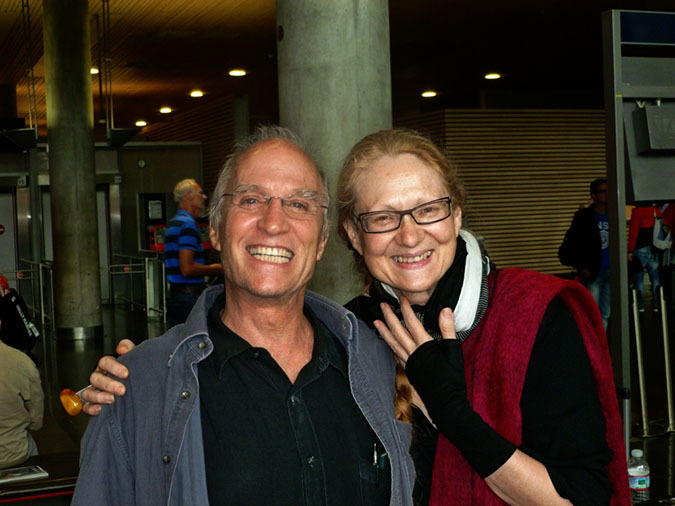 On 26th August 2012, the day prior to the conference, Stephen (Steve) V. Gerardo, Michael Britton, and Carmen Hetaraka arrived at the Gardermoen airport of Oslo. 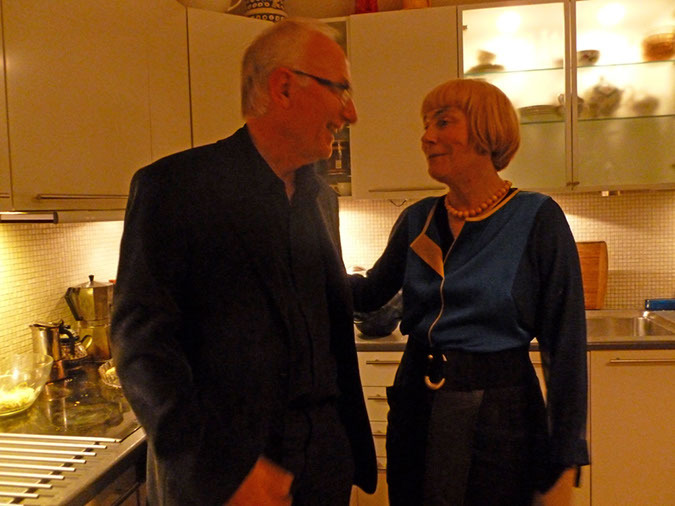 On 26th August 2012, the day prior to the conference, Nina Witoszek kindly invited to a wonderful pre-conference reception, thank YOU, dear Nina! We had a wonderful conference in Oslo, Norway! In commemoration of the tragic events that took place in Norway last year, this conference had the title 'In the Aftermath of the 22nd July: How to Sustain a Global Culture of Equality in Dignity or likeverd'. The conference advocated the notion of dignity, not just locally, but globally. We would like to invite everybody to contribute to this newsletter with your reflections (see further down)! We invite comments and thoughts both from the participants, and from those who were with us online or in spirit! And please send us your pictures of the conference to upload! All our conferences are part of our ongoing relationship-building work (rather than 'stand-alone' events). We wish to nurture a global community of people who wish to bring more dignity into the world. Our 19th Annual HumanDHS conference was overwhelming and unique in its intensity. What was particularly remarkable in this conference was the diversity of our participants - from all ages, from all continents, bringing together academics and practitioners from a great many fields. The term 'co-creation' got a much more tangible meaning for me through this conference: You co-created an entire conference as an artful 'social sculpture' of love and dignity! I am personally deeply grateful to you, since also my personal feeling of vulnerability with which I came to the conference was transformed by your depth of understanding that dignity means that we hold hands, that we help each other when we are blind for our own blindness, that we are generous in forgiving each other. I am in deep awe at the profundity of human dignity and love that you all brought to this conference!  we modelled and manifested conflict resolution in the relational ways that are also in line with indigenous wisdom. This is to name but a few examples.  last but not least, as always, we attempted to be at the cutting edge of experimenting with technology that has the potential to connect people who otherwise would stay isolated. We are especially grateful to our hosts, organisers, and conveners, Inga Bostad, Vice-Rector of the University of Oslo, and Jorunn Økland, Director of the Centre of Gender Research at the University of Oslo. We are deeply grateful for their leadership and support that they extended to us together with the Centre of Gender Research Administrator Anne Modalsli Touré and Lasse Moer from the Faculty of Social Science. Their caring presence was extraordinary. They never forgot even the smallest detail, from their generous pre-conference preparations, to their wonderful gifts in kind that they made possible for our participants - such as the conference facilities, lunch, tea and coffee twice a day, to name but some such gifts - to their deeply reflective comments and discourses, all this was beyond all our expectations. Many participants came from far away. Carmen Hetaraka, for example, traveled for 26 hours, from New Zealand to Australia to Singapore to London and, finally, to Oslo. It was a great privilege to have Carmen with us again. We had met him in 2009, in our 17th Annual Conference in Dunedin, New Zealand. His indigenous knowledge entails deep ancient wisdom, wisdom that has been made invisible by layers upon layers of subsequent historical dilemmas and cultural adaptations, and we were so grateful that we could taste and see this deep experience of wisdom through the eyes of Carmen. 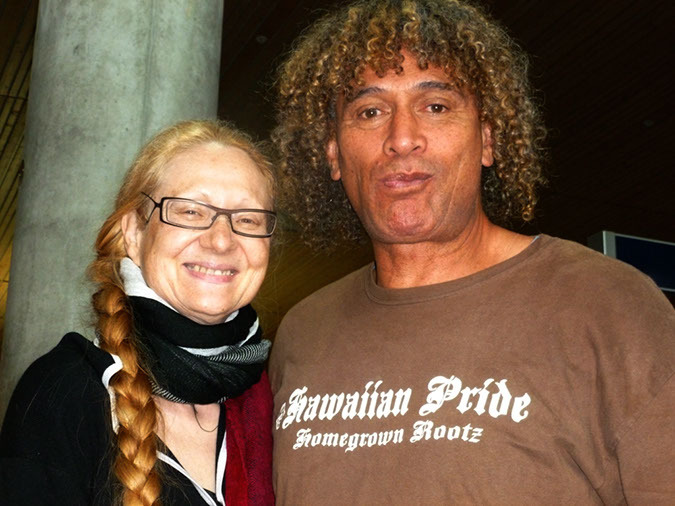 As Brigitte Volz said in Dunedin: many of us felt that we had 'come home', that both the past and the future were not important anymore: here we were, having lived most of our lives elsewhere, feeling more at home here in Maori culture. Many of us were brought to tears, when Carmen Hetaraka performed a Haka for Zehlia Babaci-Wilhite as his birthday gift to her. We want to thank all our participants for their breathtaking excellence in insights and deep passion for taking action and building relationships! 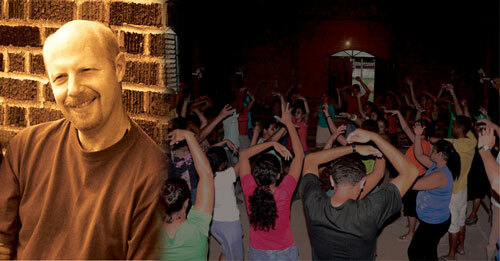 We were very sad that Dan Baron could not speak to us from Brazil, due to a sudden health scare. In Dunedin, Michael Britton spoke to us from New Jersey via video connection, and it was wonderful to have him with us in person in Oslo! 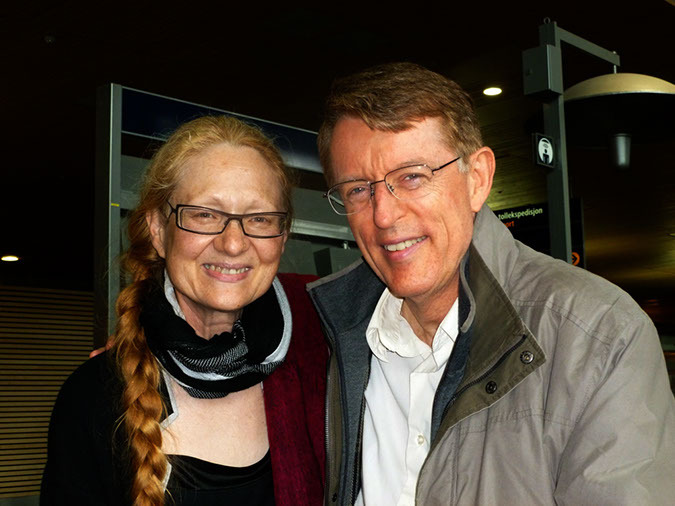 Another reason for sadness was that Linda Hartling and her husband Richard Slaven could not be with us in Oslo in person, due to their family health situation. However, we did feel them to be very close, not least because Linda conducted a parallel Online Pacific Rim Edition of the Annual HumanDHS Conference in Portland, Oregon, USA. At the end of Day Three, and on Day Four of our conference, Linda spoke to us via Adobe Connect. On Day Three she reported on her parallel conference to us, and on Day Four she sent her good wishes and greetings. She was able to get a taste of our conference through the pictures and the Adobe Connect platform. Thank you, dear Linda! In sum, this was yet another of our 'unconference' conferences: This was a unique, co-created conference. Rather than organising time around keynote presentations, we organised around human-to-human conversations, taking a highly collaborative approach to planning our time together. More precisely, we used a format of Open Space Sessions. These are conversations on topics proposed by participants. On the first day of the conference, those participants who wished to propose a topic, described it. Then, as a group, we combined and prioritised the ideas as needed, so as to finalise the schedule for the rest of the conference. We invited you to offer a topic and be open to other proposals. Also, if you made a proposal, we invited you to please kindly be prepared to be a dialogue facilitator/leader for the session. The Open Space process encouraged all of us to meet in a spirit of mutual support, equal dignity, and flexibility, which enriched the conversations throughout our 'unconference' conference! We invited volunteers to videotape Dignity Dialogues for the World Dignity University initiative following each Open Space Session. These dialogues were intended to briefly summarise the key points from the Open Space discussions, providing documentation of the group's conversation. For an example of a video dialogue, please see here. • 06 Lasse Moer and Evelin Lindner are currently downloading all the recordings from our video platform Adobe Connect. They need to be edited before they can be placed on YouTube. We hope will be able to do that. As soon as we have managed to achieve that, I will put all the links on www.humiliationstudies.org/whoweare/annualmeeting19.php. 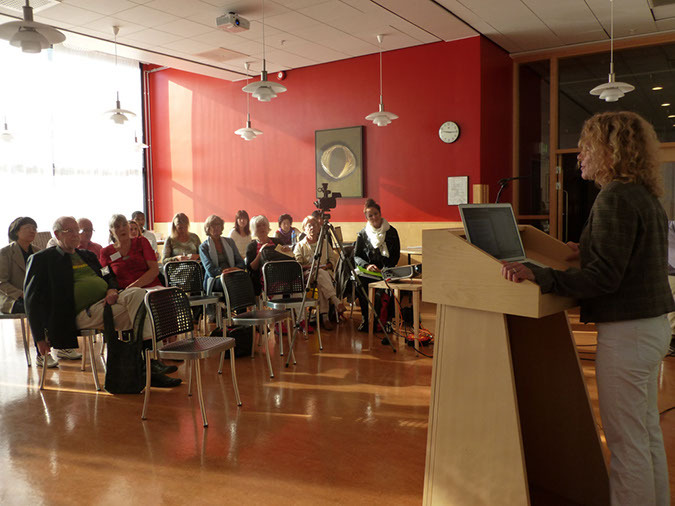 In addition to the three-day workshop for HumanDHS members and friends, Jorunn Økland hosted a Public Event entitled 'In the Aftermath of the 22nd July: How to Sustain a Global Culture of (Gender) Equality and Dignity', 30th August 2012, 13.00 - 16.00, in Auditorium 2 of the University Library of the Blindern Campus. You were invited to bring all interested colleagues and friends to this event! 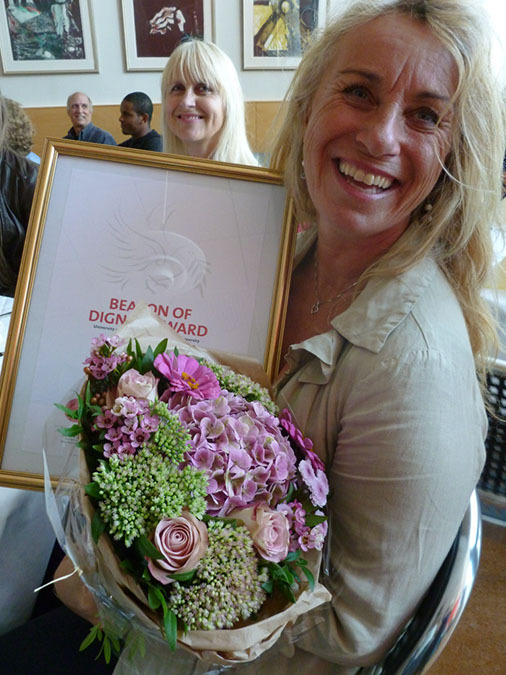 During this event, Anne-Katrine Hagelund received the Beacon of Dignity Award in honour of her crucially important work. 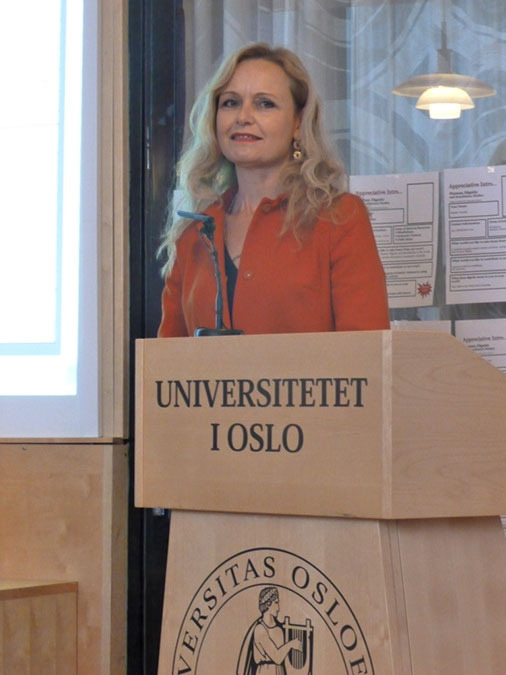 Subsequent to the Public Event, Inga Bostad, Vice-Rector of the University of Oslo, on behalf of the Rectorate of the university, celebrated Anne-Katrine with a wonderful reception to which all conference participants were invited! OUR WARMEST THANKS! In all our conferences, we always kindly ask participants who reside in the location of our conferences to give a helping hand to those traveling from afar. We greatly appreciate everyone's efforts to keep our events collaborative and affordable for all, since everybody is fully responsible for their own travel, transportation, and accommodation arrangements. There is no charge for the HumanDHS conferences or our online sessions. However, in the spirit of shared responsibility, we always attempt to assess expenses during the conference and invite participants to contribute according to their ability. We also gladly welcome electronic contributions in support of our work! Again, we warmly welcome you to all our conferences. We appreciate your willingness to be an essential part of our gatherings. Your participation is of great importance. We are certain that your contribution will have helpful reverberations not only for your work, but also for our network of scholars and practitioners working throughout the world. With the highest regards and the warmest wishes! May DIGNITY in human actions, East and West, support PEACE on Earth every day! For those of you who could not travel to Oslo or join the live broadcast, Linda Hartling, in Oregon, on the West Coast of the United States, invited you to join her for an online Pacific Rim Edition of the Annual HumanDHS Conference! This was a condensed version of the larger conference (9:30 AM-12:30 PM, Pacific Daylight Time). If you wanted to sign-up for the Pacific Rim Edition, you were invited to email Linda Hartling directly, and she sent you the instructions for joining in the dialogue. One of the most important goals of our HumanDHS conferences is to create conditions for connecting! 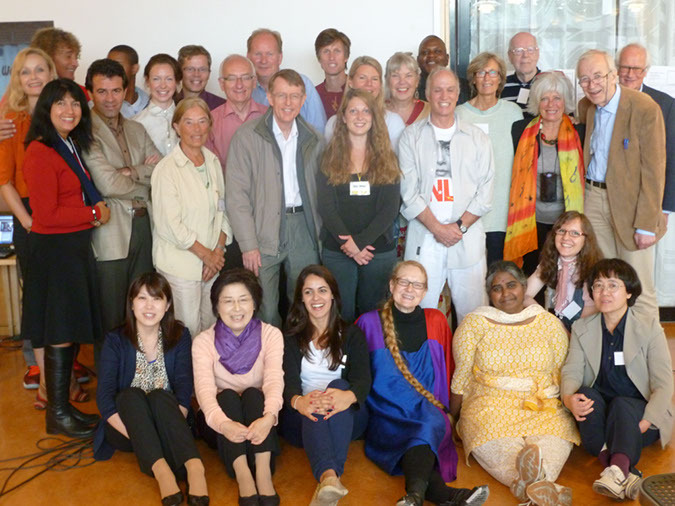 Our conferences call on us to cultivate mutually dignify and energizing relationships across continents! This conference realized a global leap forward! We not only hosted a real-time and an online conference through the University of Oslo, we also created a satellite cyber conference based in Portland, Oregon! It was my great honor to host this satellite conference, the (first ever) Pacific Rim Edition of our Annual HumanDHS Conference! For years we've known that many people would like to attend our conferences but can't because of work and family responsibilities, not to mention the expense of travel. As much as I would loved attending the Oslo conference, my dear husband's stroke (2010) has challenged me to find other ways to participate in our collaborative community. This was the inspiration for offering the Pacific Rim Edition of the 19th Annual HumanDHS Conference online. To my delight, it was an AMAZING experience!A remarkable group of cyber-pioneers—connecting from Sweden, the Amazon, Nepal, New Mexico, California, and Costa Rica—joined with me to co-create the Pacific Rim Edition of our conference. Their compassionate commitment to this work and their commitment to building mutually dignifying relationships made our time together an experience I'll never forget! In addition to hosting the online conference, I was thrilled to connect with everyone in Oslo on day three and during the public event! It was deeply touching to hear reflections from all who contributed to this year's program. I was in awe of everyone's leadership and initiative to make this conference a special experience for all! I am proud to be part of a courageous community that strives to put relationships first in every step of its work! This year's connected conferences—online and in real-time—were magnificent! I especially want to thank our brilliant Oslo hosts, Jorunn Økland, Director of the Centre for Gender Research and Inga Bostad, Vice-Rector of the University of Oslo. I also want to thank our dear Founding President Evelin Lindner for donating her entire life to bringing us together to build a world of peace and dignity for all! Thank you for participating in the FIRST EVER Pacific Rim Edition of the 19th Annual Human Dignity and Humiliation Studies Conference! Your names will go into the HumanDHS history books of cyber-pioneering!! It was WONDERFUL to be together as a mutually dignifying learning community!!! Thank you especially, dear Helio, for staying connected despite the electronics! It was very important for us to hear about the terrible challenges people are facing in the Amazon! We are so happy to have you in our community! Dear Roger, it was a pleasure to have you with us today! Thanks for joining us behind the scenes! Dearest Victoria! I loved hearing you talk about your groundbreaking work (even though Fox News was probably listening in :-) )! I am eager to see the final edition of your book! I promise to keep decolonizing my mind!! Dearest Jackie, Rachel, Hari, Helio, Roger, and Victoria, YOU ARE AMAZING! YOU are the reason HumanDHS can keep going forward! YOU give us the energy and courage to carry on!! YOU inspire every step of our community's efforts! On behalf of Evelin, please allow me to send you a WORLD OF LOVE and give you a STANDING OVATION for your courage in the world!!! With loving admiration and appreciation!!! P.S. I'll work on the notes from today's Open Space Session soon!! Dearest Jackie, Victoria, Hari, Rachel, Hélio, and Roger! On behalf of Evelin Lindner and the entire Human Dignity and Humiliation Studies network, THANK YOU AGAIN for collaborating on our FIRST EVER online edition of our 19th Annual Human Dignity and Humiliation Studies Conference! We are celebrating YOU as HumanDHS cyber pioneers for peace and dignity!! CONGRATULATIONS! I was in awe of our loving support of all who joined us, regardless of the challenges of connecting on the internet around the globe! Evelin and I can't believe we had such a WONDERFULLY diverse group of collaborators! Below you will find a summary of our e-conference with notes and videos! Please feel free add to the notes! I'm also attaching a special certificate honoring your collaboration on this groundbreaking HumanDHS conference! You are now a part of HumanDHS history! Thanks to all for your loving and supportive participation that made this event an intellectually stimulating and cyber exciting experience!!  How Do We Go About Meeting? 1. Why establish this center and where to have such a center? 2. What is a 'spiritual economy'? 3. What are others doing that is along these lines and how would this initiative be different? 4. How could this center influence policy makers? 5. How would this center/university be inclusive of the nonspiritual? 6. What would be the fundamental philosophy of such a center? 7. Would such an initiative fit with in the World Dignity University initiative? 8. How do we create a sense of 'oneness' without 'sameness'? 9. How does understanding generations of history help us go into the future together? 10. How would a 'spiritual university/center' move people beyond the security dilemma? 11. What is 'greedonomics' and what is 'needonomics'? 12. How do we empower the young in this effort, e.g., in education, etc? 13. What is the potential of media to create a new quality of engagement that realizes an understanding that violence on others is violence to ourselves? 14. How do we challenge and be firm with opposition without using humiliation? • Peace and conflict studies are a very Northern domineered, it is a neo-colonizing discipline that establishes theories from a Northern perspective. 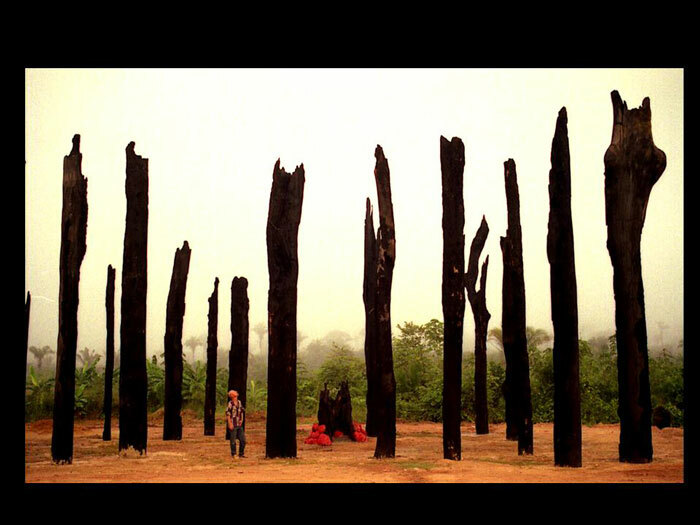 • Many of the solutions for the global South are established in the North without understanding the South. • Initiatives of the North can do more harm than good in the South. • Aid and humanitarian industries can create or sustain conflict. • See Oliver Richmond's book (2007) The Transformation of Peace: The metaphor of producing peace is like repairing a car, let's throw in good governance, elections, and institutions and peace is going to break out. • Power dynamics and neo-colonizing elements: William Easterly looked at the narratives: we are coming to help, we are benevolent, etc. • The main problem is the Cartesian paradigm that looks at the world as a giant machine. • Colonization uses tools of education systems and disseminates the thinking of the North. Educational systems transmit the Cartesian paradigm, the infrastructure of colonization has never left. • Victoria Fontan is removing the lenses of the Cartesian paradigm and offers new lenses, a different array of theories to make sense of the world in relation to peace, for example, through exploring local initiatives that are sustainable and through strengthening them. • Departing from 'peacebuilding'... which implies that there is nothing in the field already, that there are no communities that have effective practices for creating and sustaining peace. • Neo-colonist addiction to help with contributions. • We need to refrain from help addiction of the North and create a space for local peace practices to unfold. • It is not for the North to decide when, where, how, and for how long. • Decolonizing Peace is trying to create a space for dignity within the field of peace and conflict studies. • At the end of the book, Victoria calls for the global South to educate the North about successful sustainable peace practices. • We need to decolonize our minds! • Liberty of choice is not freedom. It is a condition of freedom. • Restraint does not subtract from freedom. It is another condition of freedom. • The free life does not come spontaneously to people once they have the liberty of choice. It is something that must be learned. • Freedom is not separate from values, norms and faith. These are tools for people who aim to be the authors of their own lives. • The managing of freedom is not something to turn to after the having of freedom. It is part and parcel of the free life itself. • The actual experience of freedom is not individual, but is realized in social living where people interact and deliberate with each other. How can we overcome defensive toughness and move towards maternal love, compassion and interconnectedness? I think the Maori practice of educating about birth process is very relevant in this regard. It is an example of a concrete practice which makes it possible to connect with prisoners carrying a mask of being 'a tough guy' (self-centered, defending the limited ego identity)'. It's fascinating how through learning about the birth process, including the pain the mother experience through the delivery process, the prisoner can emphasize with their mother, and perhaps all women who give birth. This is a remarkable movement towards maternal love, compassion, and embodied interconnectedness. I'm wondering if this approach, educating about the birth process, might be applied also in other cultures, to connect with the heart of prisoners, and more generally people who are stuck in a defensive 'tough' mask. What can we learn from the Maori birth process education practice... which seems to be such a profound and direct way to experience maternal love, compassion and interconnectedness? Could we imagine having a dialog educating about the birth process, as way to transform defensive toughness to move towards embodied interconnectedness, in other cultures, for example in African, American, Asian, and Western cultures? This is a question that I would like to invite the participants at the conference to explore in more detail! Det er JEG som skal takke deg for at du har arrangert disse fine dagene for oss – og som jeg er SÅ takknemlig for at jeg fikk delta i. Det ble en uforglemmelig opplevelse. De mange unike menneskene vi fikk være sammen med og lære å kjenne. De mange fine diskusjonene vi hadde og fikk delta i. Hele opplegget var nytt og meget inspirerende! En hjertlig TAKK også til Jorunn Økland og all den deilige maten hun ga oss – og ikke mins torsdag hvor hun hadde invitert kvinner jeg lenge har ønsket å treffe. Det var en tøff sesjon som jeg håper gikk inn også hos våre mannlige og internasjonale deltagere. En hjertlig takk også til Inga Bostad som ga oss dette hyggelige og lyse rommet hvor våre aktivteter kunne utfolde seg i full harmoni med god plass og atmosfære – og til hennes inspirerende ord. Takk til dere alle sammen – jeg håper å få være med videre på dette spennende prosjektet. Et flott og viktig tiltak i en verden som sårt mangler verdighet og likeverd. Combined Open Space session convened by Kebadu M. Gebremariam and Latha Nrugham at the 19th Annual Conference of Human Dignity and Humiliation Studies 'In the Aftermath of the 22nd July: How to Sustain a Global Culture of Equality in Dignity or likeverd', in Oslo, Norway, 27th - 30th August 2012. Notes taken by Selina Köhr. What makes life good for you now? What would make this a world you feel is good? An historical era you would love? Open Space session convened by Michael Britton at the 19th Annual Conference of Human Dignity and Humiliation Studies 'In the Aftermath of the 22nd July: How to Sustain a Global Culture of Equality in Dignity or likeverd', in Oslo, Norway, 27th - 30th August 2012. Notes taken by Selina Köhr. 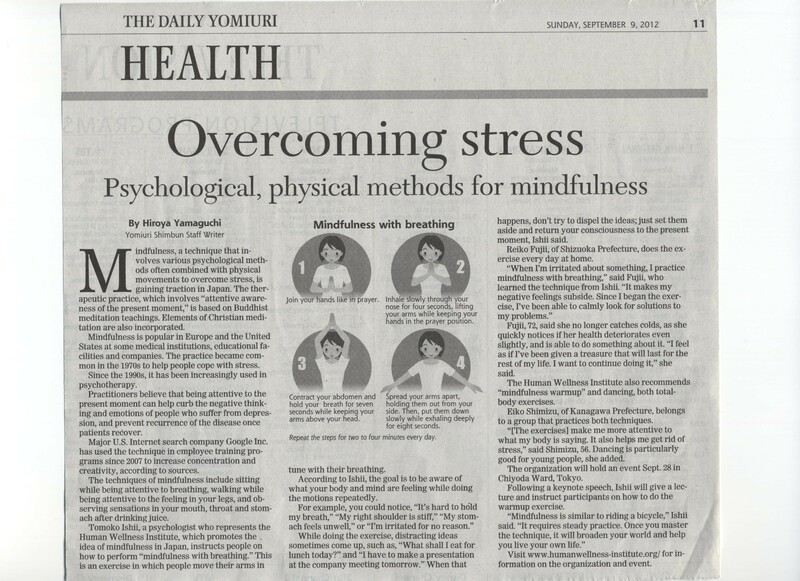 The Daily Yomiuri, June 4, 2005. 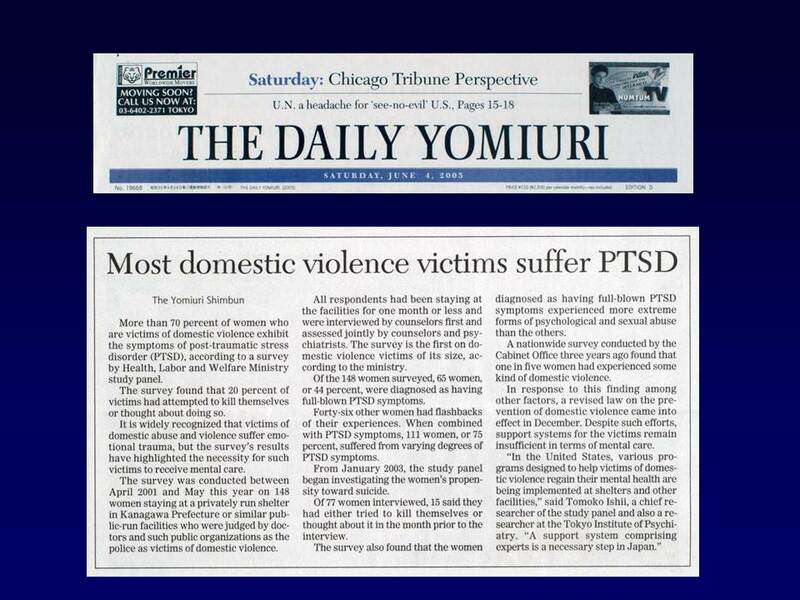 The Daily Yomiuri, September 9, 2012, see also www.yomiuri.co.jp. Paper presented at the 19th Annual Conference of Human Dignity and Humiliation Studies 'In the Aftermath of the 22nd July: How to Sustain a Global Culture of Equality in Dignity or likeverd', in Oslo, Norway, 27th - 30th August 2012. The Kashmir-Conflict from a Psychological Perspective: How do Humiliations and Emotions on the National Level Account for the Development of the Donflict? Paper prepared for the 17th Annual Conference of Human Dignity and Humiliation Studies 'Enlarging the Boundaries of Compassion', in Dunedin, New Zealand, 29th August - 1st September 2011. New York in December 2012, in South Africa in 2013, in New York in December 2013, and in Thailand in 2014.